After almost 8 weeks in Bolivia (see previous posts for Cochabamba, Salar de Uyuni, Parque Nacional Madidi, and Lake Titicaca), it was time to cross the border into Peru. From Copacabana, Bolivia, I took an overnight bus to Cusco, Peru, where I stayed for two nights. Since I’d visited Cusco three years earlier, I spent my time relaxing, journaling, and talking to people at my hostel, only venturing out to get food at a nearby local restaurant or at the local market. At the hostel, I again ran into Mathieu (France) who I’d met in Bariloche (Argentina) then ran into in Copacabana. That’s what happens on the travelers circuit. While at the hostel, I also met Renata and Gabriela (Czech Republic) who were on their way to Huaraz, Peru to do the Santa Cruz trek. After talking to them, I recalled that this trek was featured in an article in Backpacker magazine that I’d been carrying around with me all over South America. I’d planned to move quickly through Peru in order to get to Ecuador, but after more research, I changed my plan and decided I had to do the Santa Cruz trek. So, after an overnight bus from Cusco to Lima, where I stayed for a night, and another overnight bus from Lima, I arrived in Huaraz, Peru. Per Wikipedia, Huaraz (population 100,000+; elevation 10,013 feet) is the main point of entry for climbers and hikers wanting to tackle the glaciers and mountains of the Cordillera Blanca, the world’s highest tropical mountain range, located almost entirely in Parque Nacional Huascaran, a UNESCO nature world heritage site. The Cordillera Blanca range contains 722 individual glaciers and 33 major peaks over 18,040 feet high, including Peru’s highest mountain, Huascaran which is 22,205 feet high. So how did I spend 8 days amongst glaciers and high mountain peaks? Trekking of course! During the first three days in Huaraz, I reconnected with Renata and Gabriela, and befriended Peter and Dustin (Canada), who’d I’d met at the bus station in Lima. Together, we ate local Peruvian food and explored the local markets. 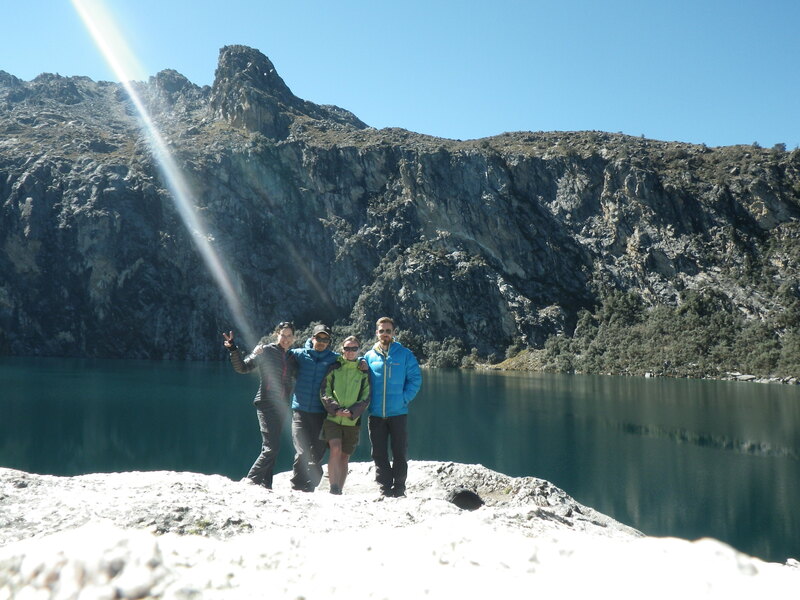 As a warm up, Renata, Peter, Dustin, and I day hiked to Laguna Churup, a gorgeous glacial lake at 14,600 feet. 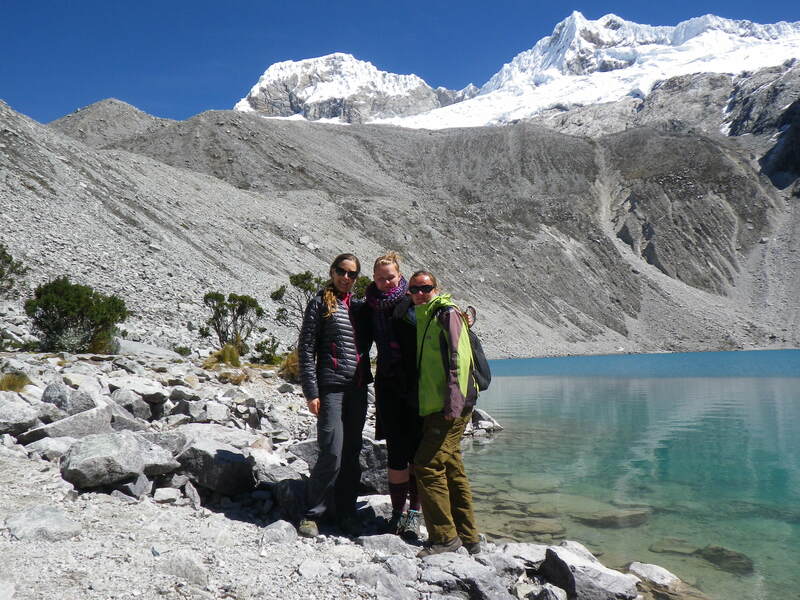 Then after a day to rest and stock up on supplies, all five of us headed to Parque Nacional Huascaran, Peter and Dustin to do some climbing and Renata, Gabriela, and I to do a 5-day trek, four days on the Santa Cruz trail and one day hiking to Laguna 69, a gorgeous glacial lake. We started the roughly 30-mile Santa Cruz trek in the village of Cashapampa (population 3,058; elevation 11,200+ feet) hiking through a narrow river valley. Eventually, the valley widened and we were surrounded by glaciated peaks. 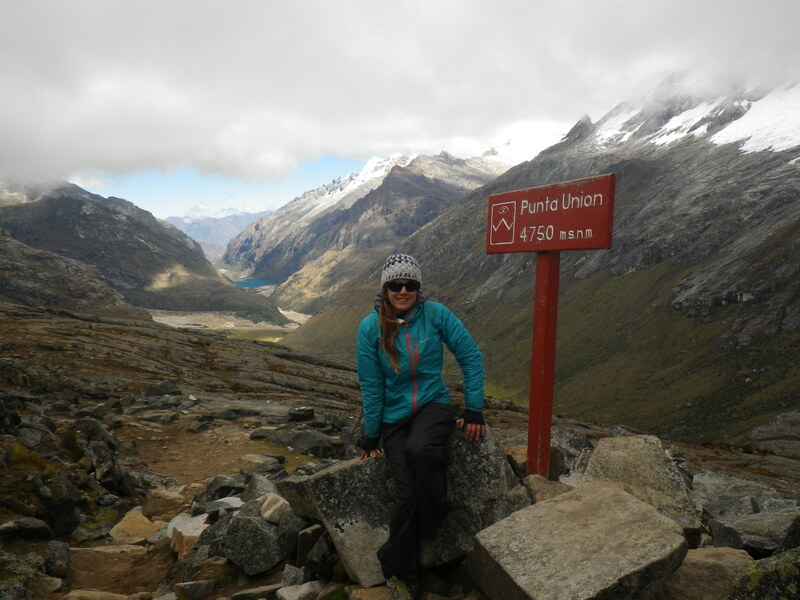 On day 3, we hiked up and over Punta Union Pass, our highest point at 15,580 feet. The scenery along the trek changed as we went, becoming more stunning with each mile. Then for the last several miles, the trek passes through small Andean villages, providing a glimpse into the rural, farming lifestyle. Besides being featured in Backpacker magazine, the Santa Cruz trek is listed among the top 20 epic trails in the world by National Geographic magazine (http://adventure.nationalgeographic.com/adventure/trips/best-trails/worlds-best-grail-trails/#/cordillera-blanca-santa-cruz-trek_56333_600x450.jpg). And Laguna 69, which we hiked to on day 5, is named by National Geographic magazine as one of the best one-day treks in South America. And with good reason as it is a gorgeous turquoise lake surrounded by snowy mountain peaks at 15,090 feet. Stunning, all very stunning! I am very thankful that I didn’t cruise through Peru without stopping as previously planned because trekking in the Cordillera Blanca mountain range and doing the Santa Cruz trek was an amazing and breathtaking experience (literally and figuratively), made even more amazing by the fun people with whom I shared the experience. At Punta Union Pass, on the Santa Cruz Trek (15,580 feet). On the Santa Cruz trek. Laguna 69 with Gabriela and Renata (15,090 feet). Travel notes: recommend Akilpo Hostel, Huaraz (nice staff, good wifi, good shared kitchen and rooftop patio); tap water in Peru is NOT potable (treatment needed). Bolivia allows Americans to stay for 90 days, but you must extend the visa after 30 days or pay 20 bolivianos/day for each day past 30. I didn’t read the date on my entry stamp and overstayed my 30-day visa by 24 days. So, I had to pay 480 bolivianos (~$70) upon leaving Bolivia. Darn! 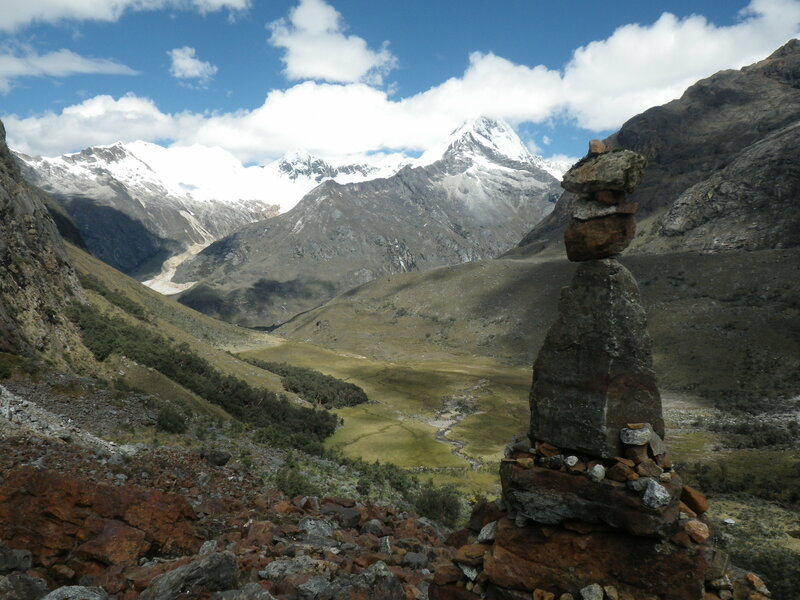 This entry was posted in Peru, South America and tagged Cordillera Blanca, Huaraz, Laguna 69, Laguna Churup, Parque Nacional Huarascan, Santa Cruz trek by Tannika. Bookmark the permalink.